The notion from the O'Donohue quote that “nothing ever disappears, nothing is lost” captured my imagination. I was reminded once again of precious experiences vanishing when I ventured to the yard Sunday afternoon for another look at the gorgeous spider web, pictured above, which I photographed Saturday by my much-loved dahlia bed. Much to my dismay, the web was gone just a day later, with only an anchor thread now visible from a red dahlia to a wire or branch many feet overhead. Where did the web go? Was the spider finished with it? I watch my dahlias carefully enough to know that the web was not in place a day before I noticed it, that it was spun seemingly overnight, and disappeared just as quickly. I spotted the web on approach because the spider was poised at the web’s center, virtually suspended in thin air. Said spider disappeared into the closest bloom as I advanced. 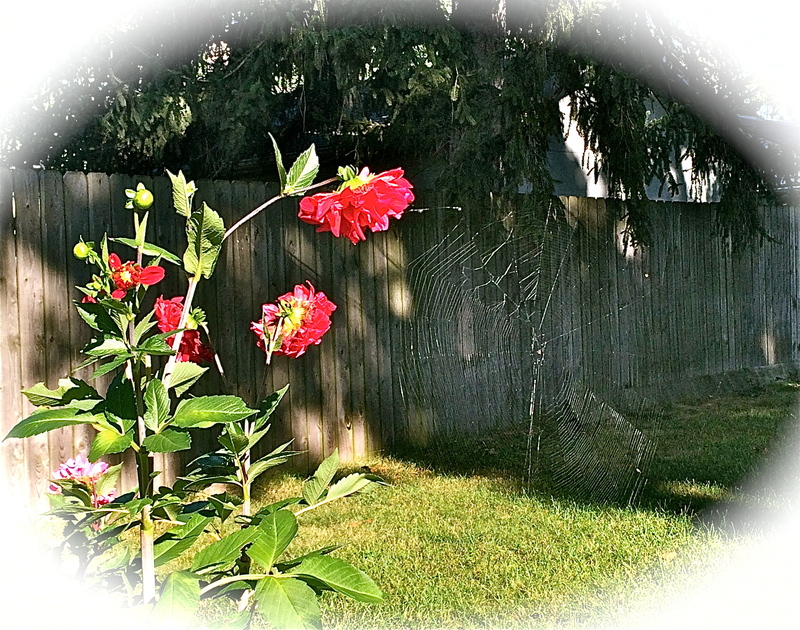 In order to bring that beautiful web out of the shadows, I took the photo from inside our garden, so that the web would show up against our fence, and had to work diligently to make the web visible with lightening and brightening filters. Acknowledging to my Facebook and Instagram friends and followers that #nofilter folks would not like this one, I am quite pleased with having rescued the web's beauty from no notice, especially since I found it gone just a day later! You can read the rest of the Tippett/O’Donohue interview here. Next Sunday, during the first of six streams of spirituality worship services at Kern Road (based on Richard Foster’s Streams of Living Water), we will consider the contemplative tradition: the prayer-filled life, which focuses on nourishing our relationship with God and the inner life through prayer and contemplation. I would add that beauty, receiving it, reveling in it, recording it, reliving it as/when needed, nurtures the contemplative way, most certainly helping to harvest “your deeper life from all the seasons of your experience.” How has beauty enhanced your relationship with the Divine?